Amy Taylor has her sister Katie to thank for introducing her to care work. Katie introduced Amy to the office team and encouraged her to apply for a job as a care worker. Amy, however, was not convinced she would like the role or even be any good at it. At that time, 18-year-old Amy was shy, timid and not particularly excited at the thought of delivering personal care; that was 3 years ago.Amy did start and the team agreed to work with her and see how well she progressed. Very quickly Amy learned to do the job very well and even enjoy it! Clare Tombs her Care Manager has witnessed Amy make huge strides in her professional abilities and also blossom and develop as a person. 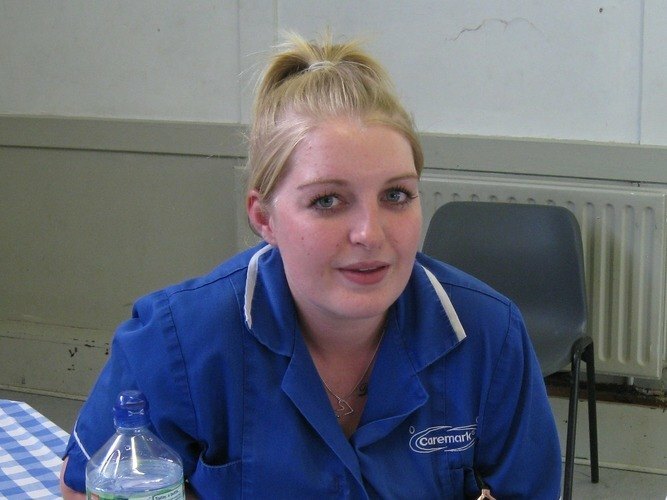 Amy has learned the Caremark system very well and is an effective communicator on all levels. She is commended for always being very thorough with her reporting and more importantly is able to spot subtle changes in clients’ situations which may need assistance from management or other health professionals. The standard of her work and her overall attitude has impressed her management team who have seen her grow into a thorough professional. Managing Director, David Porter observes: “Despite dealing with some very difficult, personal situations Amy continues to grow and mature and become our clients’ favourite”.